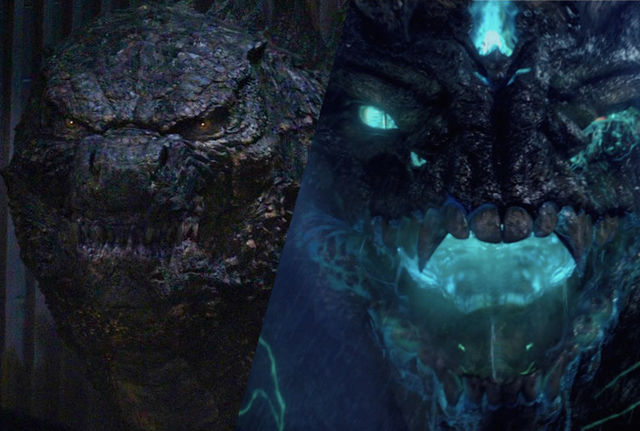 Legendary has revealed the official titles for both the Godzilla sequel and the Pacific Rim sequel in a fairly innocuous press release about the hiring of production execs. Godzilla: King of Monsters will be the name of the sequel to Gareth Edwards’ 2014 hit, which will be helmed by Michael Dougherty (Krampus) and is currently scheduled for release on March 22, 2019. Godzilla, King of the Monsters! was the title of the 1956 American release version of the original 1954 Japanese Godzilla film, which featured footage of Raymond Burr added in to Americanize the film. Pacific Rim: Uprising (previously titled “Pacific Rim: Maelstrom”) is the moniker for the February 23, 2018 release starring John Boyega that is currently shooting in China and Australia under director Steven S. DeKnight (Marvel’s Daredevil). Legendary today announced the hiring of three veteran production executives to its feature film operations including Herbert W. Gains, who has been named EVP of Physical Production, Valerie Flueger Veras who has been named SVP of Post- Production and Sara Flamm who will take on the SVP Physical Production role. The new additions were announced by Mary Parent, Legendary’s Vice Chairman of Worldwide Production. “Herb comes to us with a tremendous body of experience working alongside some of the most prolific filmmakers in our industry,” said Parent. “His strong business acumen and commitment to supporting the vision of storytellers with preeminent production resources makes him an excellent complement to our team here at Legendary.” Gains will report directly to Parent, effective immediately. Best known for his work as Executive Producer on such films as Warner Bros’ The Judge and Watchmen, as well as the recently released Jack Reacher: Never Go Back from Paramount, Gains’ responsibilities will include overseeing production of Legendary’s feature film slate including such highly anticipated projects as Pacific Rim: Uprising, Pokemon’s Detective Pikachu and Godzilla: King of Monsters. Gains will also work closely with the post-production team insuring that the filmmaker’s vision remains intact through production to final distribution. Flueger Veras is a seasoned executive who has lead the post-production efforts on some of the most critically-acclaimed films of the last decade including Oscar-nominated feature films, The Revenant, Selma and Nebraska. As SVP of Post-Production, Flueger Veras will immediately begin overseeing post on the upcoming Spring action film, Kong: Skull Island. Most recently Flamm worked alongside Gains as Unit Production Manager on on Jack Reacher: Never Go Back and the upcoming film Geostorm. She has also worked as Production Supervisor on numerous hit films including The Judge as well as comic adaptations, Green Lantern and Legendary’s own Watchmen. In Flamm’s new role she has already begun work on the production of Pacific Rim: Uprising, currently shooting in Australia.